Keratoconus is a bilateral, progressive disorder of the cornea (the clear front surface of the eye) which causes it to thin and bulge into the shape of a cone. Prevalence is about 1 in 2000. This cone shaped curvature causes a loss of vision similar to taking a picture through a warped camera lens. The cause of keratoconus is not completely understood, however underlying genetic factors have been shown to play a large part and the genes responsible for it have been identified. Not everyone with the keratoconus gene gets the condition, so environmental factors such as allergies and resultant chronic eye rubbing, are believed to play a part in turning the genes on. The natural course of the disease begins with a normal cornea early in life. As the patient enters their early teenage years, the cornea begins to take on its cone-shaped progressive curvature changes. Keratoconus is often misdiagnosed as simple astigmatism in this early stage since the patient is still fully corrected to 20/20 vision and the corneal changes cannot yet be seen on standard examination. Computerized topography examination of the cornea would be able to diagnosis the condition at this early stage, however this is rarely performed as part of a routine eye exam. At this stage the patient is often prescribed glasses and is happy with their vision for the next several years. Typically in the late teens or early 20’s, keratoconus enters its moderate stage and causes its most rapid changes. At this stage, astigmatism increases rapidly and along with it decreasing vision. Physical changes to the cornea can now often be seen during a routine eye exam. During this stage, glasses are often unable to provide acceptable vision, so rigid contact lenses are used. Rigid contact lenses provide better visual outcome than glasses by being able to better mask the irregularity of the cornea curvature. If keratoconus progresses to an advanced stage, the cornea becomes hazy due to scar tissue formation. At this advanced stage, a cornea transplant becomes necessary to regain sight; however post surgical rigid contact lenses are often still necessary to provide the patient with useable vision through the transplant. Once keratoconus progresses, there is no way to reverse the changes it causes. So the goal has been to find a way to stop the progression. Enter Corneal Cross Linking. Approved by the FDA in April of 2016 (although frequently used “off label” for several years before formal approval), Corneal Cross Linking provides a means for stiffening the cornea in order to halt the progressive steepening and thinning of keratoconus. It does this through an enzymatic process which creates new molecular “Cross-Links” between collagen fibers in the cornea, thus strengthening the corneal tissue. Step one removes the top layer of cells, the epithelium, from the cornea. This allows the primary cross linking agent, Riboflavin (Vitamin B2), which activates the cross-linking process to penetrate deep into the cornea. In step two, Riboflavin drops are instilled onto the eye every few minutes for about 30 minutes or until the Riboflavin can be seen penetrating the entire depth of the cornea. Step three uses UV light applied to the cornea for 30 minutes. The UV light activates the Riboflavin to create the strong cross-linking bonds to form within the cornea. Many studies have been performed on the safety and efficacy of Corneal Cross Linking. US, Italian, and German studies have shown 100% of treated eyes demonstrate no progression in keratoconus over the course of 60 months. Few medical procedures demonstrate 100% efficiency such as this. In addition, not only do studies show keratoconus does not progress after Cross Linking, but the pre-existing steepening cone shape of the cornea caused by keratoconus significantly reduced. 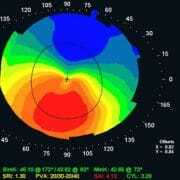 This improved corneal contour is credited with 53% of Cross Link study patients demonstrating improved best-correctable vision following their Cross Linking procedure. Corneal Cross Linking is the only procedure shown to stabilize and in some cases reverse the changes caused by keratoconus. Left untreated, keratoconus can progress to visual disability. Glasses and contact lenses can only mask the symptoms in its early stages. To give yourself or family the best chance of long term good vision living with keratoconus, the key is to diagnose the condition early in its course, preferably in the teens to early 20’s, and then halt its progression through Corneal Cross Linking. Seeing your optometrist yearly, especially if you have a family history of keratoconus, can help you get the earliest possible head start on your diagnosis and treatment.